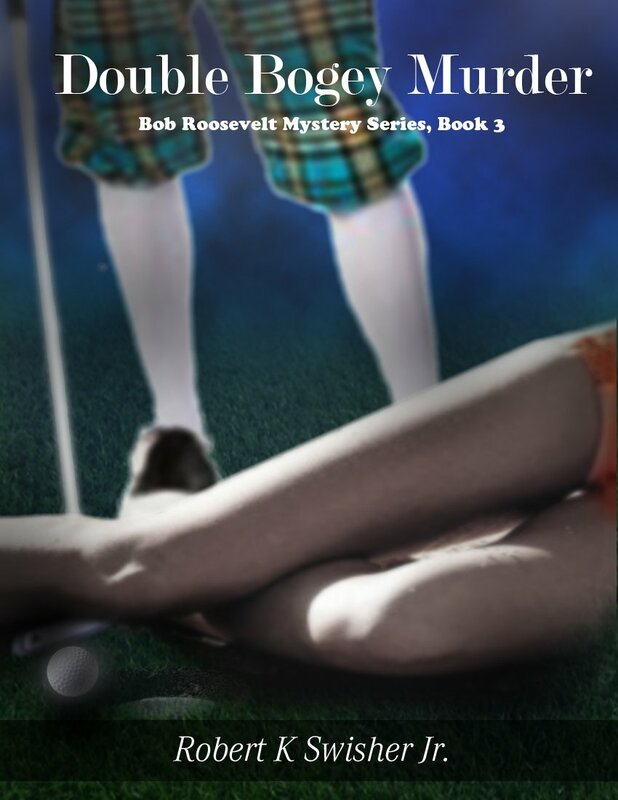 Double Bogey Murder (Book 3) by Robert K. Swisher Jr.
For Reno – to hell with those cattle old pard – it’s time to let the fence fall down. They hadn’t rented carts. There were at least four of us on the course who still have legs. Since I have never been good with money, I agreed to play in their skin game. “Besides loosing a lot of money you are making one big mistake, your golfing and falling in love fantasy is about to sink,” my Guardian Angel said. “People don’t like to be talked to when they play golf,” I told him. The first hole was a dogleg left, par four, 428 yards long, with nothing but sand dunes covered by small bushes and large cactus on either side of the fairway. Beyond the sand dunes to the right were brand new stucco homes big enough a man’s parent’s, all his grown kids, his first wife, his new wife and her three kids, and her ex-husband, could all live and never see each other. They probably started at around a million and were owned by rich people from Belize who left South America to get away from Americans. The first lizard skin hit his drive down the middle of the fairway. The second lizard kind hit it down the middle. The third lizard skin hit it down the middle. I took two practice swings, lined up, and hit it hard, but pushed the ball to the right deep into the sand dunes Powell could have used to practice tank maneuvers on before he went to Iraq. “It’s a tough shot from there,” one lizard skin said. “You’ll find it,” another lizard skin said. “Get out your money,” the last lizard skin said, smiling like a cat playing with a mouse. “Please, don’t go look for your ball,” my Guardian Angel begged. “What did I tell you about talking,” I warned him. “Is Roosevelt annoyed he hit his little white ball into the rough,” he taunted. I’d kept a good eye on the flight of the ball and marched determinedly after it. Once I was in the sand dunes, I could no longer see the fairway. After a few minutes of futilely looking for my ball, but seeing nothing but lizards, cactus, and Inca doves, I was about to drop another ball when I saw a small hill of sand more than two feet tall and six feet long that I hadn’t looked behind. I prayed my ball was there. Taking a two shot penalty on the first hole isn’t exactly the way to start off a leisurely afternoon. “Forget the hill, take the penalty,” my Guardian Angel said. Walking around the hill my Guardian Angel gasped. There was my ball. I had a clear shot to the green. There was only one problem. I had a bad lie – my long distance golf ball that was designed to stop within twelve feet if it landed on concrete rested between the breasts of a naked lady – a naked lady with a short piece of rope around her neck and her dry tongue hanging out of the left side of her mouth. Ants were crawling on her eyelids. “You have always been good at wrong decisions,” he said.